Freshmen Hoyas seem to be experts on just about everything except how much Natty Light they can handle. I’m still waiting for those statistics to come out from this past school year so I can see exactly how many people were GERMSed. I, like almost everybody else, probably know a good chunk of the fallen. Well, lie down forever, lie down I guess. This isn’t something unique to only Georgetown. All around the country as the natural heat of summer fades away, it is replaced by an artificial cloud of sweat found at a college campus near you (coming this August). Freshman packed into tiny dorm rooms that barely fit two take part in a ritual known as the Discovery of Alcohol. This tradition is especially enlightening for over-achieving high school students who spent most of their weekends in their rooms studying in order to gain admission to schools such as Georgetown. Being unskilled and naive, their low tolerances for Natty usually cause them to fall during the first wave (so around 10 P.M. EST). I have never been drunk before. Personally, I hate the taste of alcohol (except when it has been converted into the blood of Jesus Christ) and so when I was first offered a Radler by my host mom here in Germany I cringed at the aftertaste. Later I found out that the Radler I had was alcohol free… It’s like the drinks they give to 12-year-olds here… However, I don’t mind when people drink either. I actually love it when nice tipsy people come up to me saying things like “Wow, you’re really pretty!” Trust me, I’m all for those compliments. I just start to worry when I see them passed out on the floor blowing little alcohol bubbles on empty stomachs. 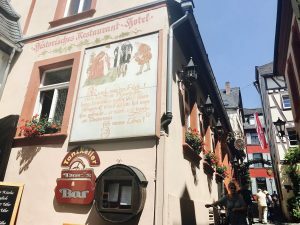 I’ve actually found that because Germans are introduced to alcohol at a much younger age than in the States they are paced to handle alcohol in a way which prevents binge drinking. By the time they’re 18 they know how much they can stomach and won’t be afraid to call for help if something does go wrong. Since you can’t drink in the U.S. “legally” until you’re 21, teens tend to jump into the game with over-excitement. It’s kind of like the “wow, they said not to touch the stove so I’m gonna touch the stove” phenomenon. I’m clearly not a psychologist and frankly sound like a mom right now but it’s true! It’s a bit counter-intuitive but it works! So if people ask me about my opinion on changing the legal drinking age to 18 I just might refer to German drinking culture. They’ve got better drinking habits AND beer for a good reason.